Christmas is all about gathering with family and friends, celebrating traditions, making memories, and of course, breakfast. Make this year's holiday easier with some of our suggestions for truly special, memory-making breakfasts. We have fun treats for the kids, special surprises for the grown-ups, quick fixes for a no-fuss Christmas morning, and traditions from around the world. 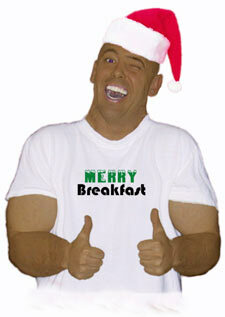 Have a very merry breakfast! 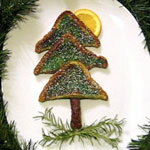 A Christmas tree for breakfast?! This is an easy-to-make goodie that no child will forget! Here, we use eggnog to flavor the batter - and your home - with the smells of Christmas. Set out a dish of dried cranberries and golden raisins - and let your children "decorate" the trees! Get the recipe and how-to VIDEO here! 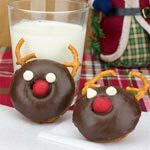 Adorable cake donuts decorated like reindeer. Also includes Donut Snowmen and Donut Wreaths. Substituting eggnog for the milk (or water) in your pancake batter is a quick way to turn a tratitional breakfast item into a holiday treat. We found this unusual gem in a Campbell's Tomato Soup advertisement in the December 1969 issue of Ebony Magazine. 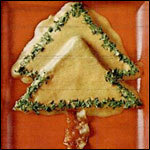 Toast, cheese, bacon and tomato soup come together in this recipe to form a Christmas tree. Unusual and delicious. Get the recipe & see the 1969 ad here! Just as good - if not better - than the expensive version you get from you know where. Plus, you can make everything in advance. 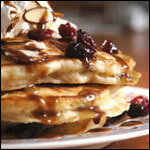 A sweet and delectable caramel topping makes these cranberry almond pancakes unforgettable. Make a new Christmas morning tradition and serve these to the whole family! Forget the coffee-shop, this holiday-spiced latte is quick and easy to make at home from ingredients you already have in the pantry. Don't save it just for breakfast though, because it's a perfect complement to a holiday meal too! 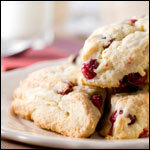 Scones are perfect for the holidays - they're easy to make ahead of time and always impress! This buttermilk scone is packed with Christmas flavor and is perfect not only for breakfast or brunch, but any time guests arrive. 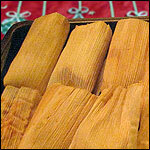 Tamales are a traditional part of many holiday celebrations all throughout Latin America. This custom dates back over 2000 years to the Maya people who would use them for feasts and religious festivals. Try this delicious cheese and chile tamale recipe for your next family gathering. Be sure to make extras to freeze for another day! 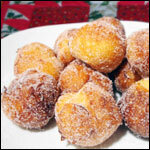 Bunuelos are a Spanish treat, similar to a doughnut or fritter. The crispy fritters are often coated in sugar, or drizzled with honey and traditionally served on Christmas morning. Here we just coat them with a little sugar, but make them your own by dipping in some fresh raspberry jam, or add in some cinnamon or nutmeg! 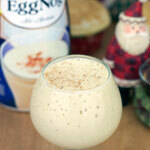 Add some nutrition to holiday eggnog by blending it with bananas and other good stuff. The shot of brandy is completely optional. Okay - here's one for the grown ups! 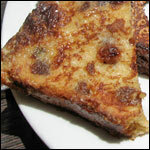 Ordinary raisin bread takes a dip in rum - and viola! It's a party for your mouth! You'll find reasons to have this on every holiday of the year! 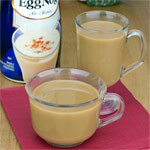 Here's a little secret: you can use eggnog just about anywhere to turn ordinary recipes into a holiday treat! 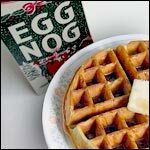 Here's our favorite eggnog waffle recipe. It's super simple and delicious! 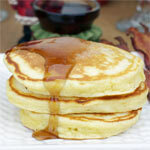 This is one of the most popular holiday recipes on MrBreakfast.com! 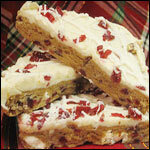 I guarantee that if you make these Cranberry Bliss Bars just once, you'll be hooked for life! I find ways to make them for just about every holiday. There's no BAD time to make them! 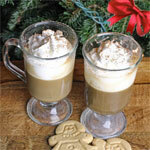 A deluxe, delicious Christmas coffee drink that's a combination between an Eggnog Latte and a Mocha Cappuccino. 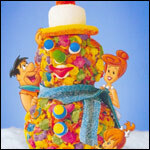 This is like a magical, technicolor, fruity rice crispy treat - a Fruity Pebbles Snowman! It's a fun activity to do with the kids on a cold winter day. Simply shape the mixture into "snowmen" and decorate with marshmallow hats, gumdrop eyes, licorice scarves.. The possibilities are endless! There's eggnog in the batter and eggnog in the icing. 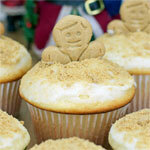 Then, that gets topped of with a delicious sprinkle of crushed gingerbread cookies. 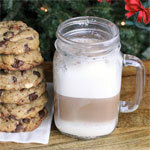 This warm holiday treat requires only 3 ingredients: milk, chocolate chips and crushed candy canes. 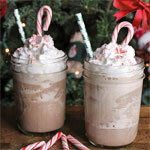 If you have some whipped cream and an extra candy cane for a decorative stirring stick, that's just icing on the cake (or "whipped cream on the cocoa" as I like to say). It happens every year - at every holiday meal: "What to do with the leftover mashed potatoes?" This is an easy - and delicious way to use your leftovers on Christmas morning! Try adding some shredded parmesan and some chopped parsley or basil for color - or spice them up with jarred roasted red pepper or jalapenos! The red and green colors make them even more festive! This could be one of the simplest and most beautiful Christmas breakfasts ever! Store-bought refrigerated cinnamon rolls with a quick homemade icing will have you Rockin' Around the (Breakfast) Christmas Tree in just 15 minutes! Here's a classic strudel-type coffee cake with a cinnamon-sugar filling. Just twist it in the shape of a candy cane and decorate with gum drops and icing to give it the appearance of that favorite Christmas treat! 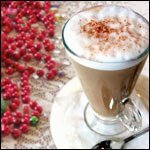 The easiest way to add holday cheer to your breakfast is to just replace the cream in your coffee with eggnog. 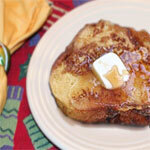 Rich, indulgent holiday bread becomes rich, indulgent holiday French toast. 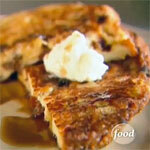 Watch Food Network star Giada De Laurentiis make this special breakfast. 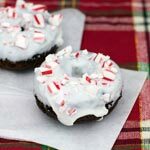 Chocolate cake donuts with vanilla icing and crushed candy canes for the holidays. 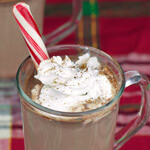 A warm, inviting swig of the holidays you can make with ingredient you probably already have. Includes handy tip for making milk froth with a jar. 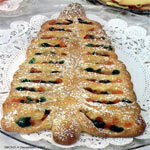 Sweet dough shaped like a Christmas tree and filled with mixed candied fruits. The trick is to just replace milk with eggnog. Very easy! Only four ingredients. 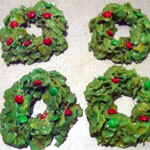 Cute Christmas wreaths made from corn flakes and marshmallows. Tastes a little like Rice Krispies treats. 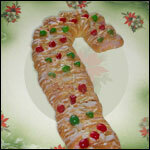 The Christmas season here begins on St. Lucia Day, December 13. That morning, the oldest daughter of the house dresses in white and wears a wreath with seven lit candles on her head. She serves the other members of the family breakfast in bed. Christmas breakfast here includes a sweet bread called Cougnou, which means "Bread Of Jesus". The bread is shaped into the form of wee baby Jesus with currants for eyes. It's also served at traditional Belgian Easter celebrations. Tamales are the official food of the holiday season in these parts. Families get together days before Christmas to make enough for the holiday and to start the new year. On Christmas morning, hot coffee and bunuelos are a great way to start the special day. Many residents here are ancestors of old seafarers. Their dying custom is eating oysters - either fried or in stew - for Christmas morning breakfast. You can fry your own Christmas oysters by dipping them in egg, dredging them through cracker meal and frying them up. At breakfast on Christmas Eve morning, natives here have a rice porridge with cinnamon, sugar and milk. An almond is hidden in the porridge and whoever finds it first is believed to have great luck all through the following year. They might even get married! Christmas breakfast in Jamaica usually includes ackee and saltfish (salted cod), breadfruit and fried plantains. Ackee is the national fruit of Jamaica. It's flavor has been described as being similar to scrambled eggs. Seriously. But be careful. If the inside of the fruit is not ripe or overly ripe, it's poisonous. And that's no good for a holiday breakfast. Don't throw anything away until you look at our recipes that use holiday dinner leftovers. Those mashed potatoes? They make wonderful potato pancakes. All that stuffing and turkey? Who's up for a marvelous Country Benedict. 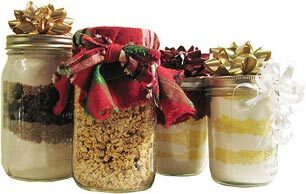 Our special section dedicated to those charming gift jars has everything you need: the recipes, tips to make them pretty and a special printable, personalized recipe gift tag to attach to each one. Fancy looking presents made with stuff from your cupboard. The holidays just got a little easier. Just for fun! Take some time off holiday cooking and dig our museum of every holiday-themed breakfast cereal ever made. Click a box. Mr Breakfast wishes you the happiest of holidays! Remember to start each day with a moment for yourself and for your family. May your New Year be filled with breakfast! 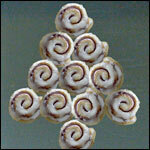 And may all your Christmases be white... or wheat, toasted golden brown as part of a nutritious delicious breakfast!